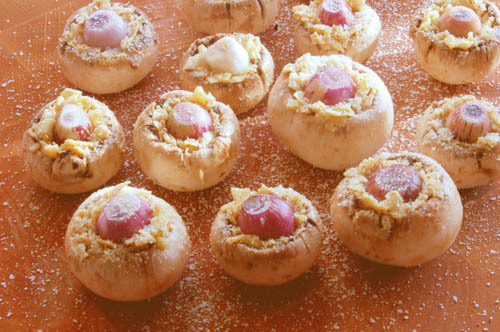 These mushrooms are a little more complicated than your average stuffed mushrooms, but the result is simply divine. 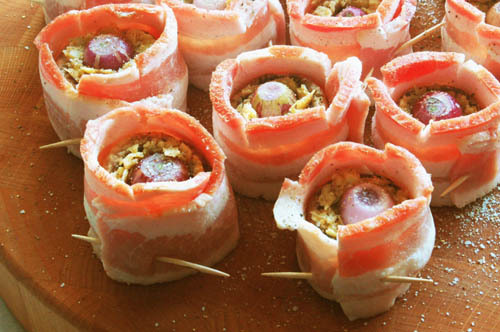 The combination of mushroom, artichoke hearts and onion all wrapped in bacon creates a simply magical layering of flavors. Drain the artichoke hearts well. Dice them to about 1/3" until you have about one cup. 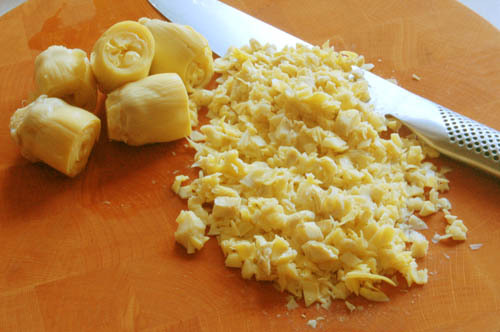 Put the diced artichokes in a small bowl and add the olive oil, and both kinds of chile powder. Mix well and set aside. Remove the stems from the mushrooms and use a teaspoon to gently hollow them out. You want to remove all of the dark gills and scrape down until you just start to see the white flesh. Fill each cap to just a little past level with the artichoke filling. Do not pack the stuffing more than just enough to fill the cap. Slice off both ends of each pearl onion. Gently peel off the paper and the first layer of flesh. This is a little tedious, so be patient. 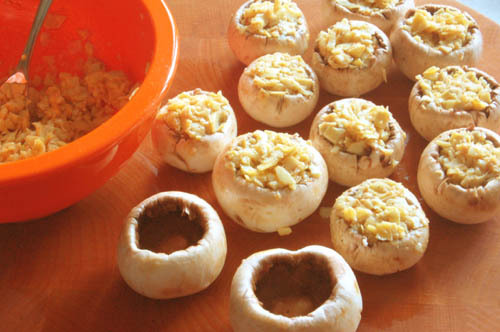 Push one peeled onion into the stuffing of each mushroom cap, leaving half of each onion exposed. Sprinkle each cap moderately with garlic salt. 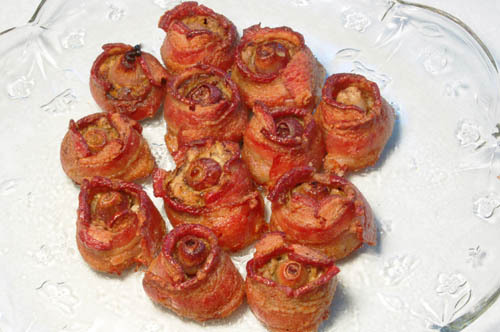 Use about 4/5 of a slice of bacon to wrap each mushroom as shown in the picture. You need the ends of the bacon to overlap by about an inch. Pin the ends of the bacon together with a toothpick as shown. Make four small equally spaced slices in the part of the bacon that extends above the top of each mushroom. This will allow the bacon to form around the top of the mushroom. Sprinke each mushroom moderately (or to taste) with black pepper. Put the mushrooms on an oiled broiler pan and into a preheated 350º oven. Bake for approximately 90 minutes, or until the bacon around each mushroom is just barely crisp. Put the mushrooms on a serving platter, removing the toothpick from each one. To make the toothpick removal easier, spin it between your index and second finger (like you would wind a watch) while you pull it out. Serve and enjoy these while you can, because they won't last long. Tip: Here is a much simpler and less time-consuming way to peel the pearl onions. Idea: These would be excellent with a half-and-half mixture of lump crab meat and artichoke. Note: Of course you could do these on the grill with indirect heat, but I would not recommend smoking them (gasp). I think it would be way too easy to overpower the flavors. Your ingredient list is missing the artichoke hearts. Not to be picky, i know the next paragraph mentions them but just so you know. Whoa, what a huge oversight. Thanks for bringing that to my attention. No problem. I thought you might wanna know. haha. I am actually gonna make these hopefully for new years. my mum LOVES stuffed mushrooms. Im making your 4 layer cornish hens tomorrow. they are thawing as we speak. I have been looking for an awesome recipe for game hens but could never find one that suited my palette(hope thats the correct spelling). I have been working on my brines the last few days so i liked what i saw in yous. In regards to your idea section...where do you get crap meat? These look great! I think I'll be bringing some to the brunch this Sunday! Chris - This recipe doesn't include crab, but I can find lump crab meat in cans at local grocery stores. Costco also carries it.